One of the most active centenarians in the county, Jim Burke Daly, celebrated his 100th birthday yesterday (Tuesday). He still enjoys making jam, cycling his bike and driving his tractor - and dancing. 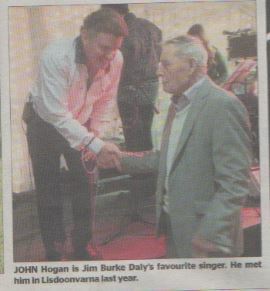 John Hogan is Jim Burke Daly's favourite singer. He met him in Lisdoonvarna last year. 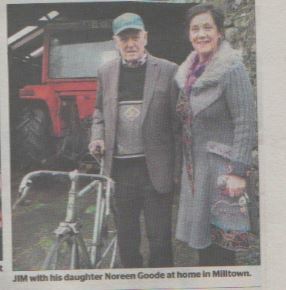 Jim with his daughter Noreen Goode at home in Milltown. Forget the car, Jim's favourite mode of transport is his tractor. Jim makes his own jam every autumn. Jim bought a new lawnmower last year. AS 100-year-old Milltown man Jim Burke-Daly celebrated his biggest birthday yesterday (Tuesday) he took his tractor out of the yard for a drive only hours before taking to the dance floor to celebrate reaching the century at a party in Tuam’s Árd Rí House Hotel. “Driving a car is only a cod and I wouldn’t bother with one as I have always loved driving the tractor. 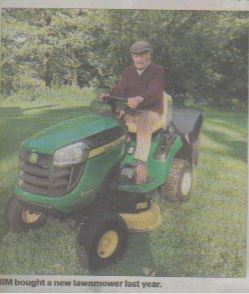 I drive the tractor regularly into Milltown to do my shopping,” says Jim, whose other passion is dancing. The sprightly centenarian, who still cycles, did a twirl around the floor of the kitchen in the family home to display his dancing skills. His daughter Noreen Goode takes him to the Lisdoonvarna Festival “for two weekends every autumn” and he loves to dance in the various pubs late into the nights. Noreen also takes him to dances in the McWilliam Park Hotel, Claremorris and to dancing classes which she teaches in Ballymacward. Jim has been a widower for 17 years since his wife passed away. They had five children, Noreen, Teresa, Eileen, Sean and Mary (RIP). Jim has always remained active and apart from flying to France with his son Sean, a captain with Cityjet airlines, he has also travelled to visit his daughter Teresa and her husband and family in Sweden and flew to the USA in the past to visit one of his brothers there. Longevity is in the family as Jim’s uncle Augie Acton, Kilbannon who passed away in November, was 99 and would have reached 100 if he lived until next July. Jim’s parents, Michael and Nora from Ironpool, Kilconly also lived long lives but while he is the eldest of a family of six, four of the others have passed away, with only him and his youngest brother Anthony still alive. According to Jim the secrets of a long life include hard work, cycling, “eating three good meals every day” drinking only in moderation “and dancing of course”. 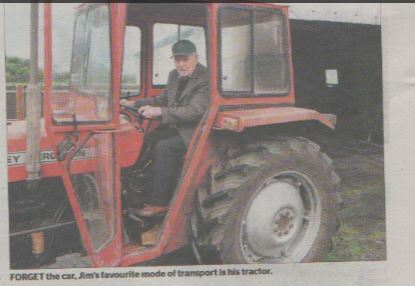 While he is fortunate to have so many of his family around him, Jim still loves to cook and do the washing as well as travelling, on his tractor, to collect the shopping. 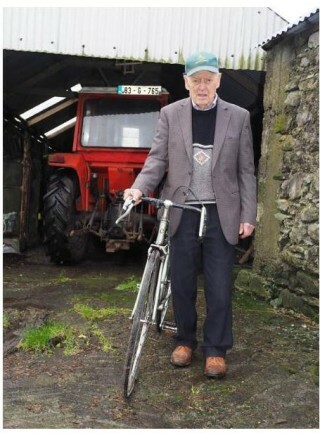 Apart from farming he cycled to work during the annual campaigns at Tuam Sugar Factory. He worked in the building of the factory in the 1930s and on its demolition in 1987. Married at 27, Jim juggled farm work and turf cutting with various other jobs including work in sawmills in Tuam, Moylough and Portarlington as well as being an employee for many years on the roads with Galway Co Council. Article published in The Tuam Herald on Wednesday 6th January 2016.